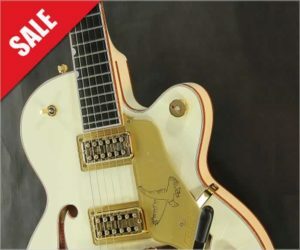 This Gretsch G6112TCB-WF Limited Edition Falcon Jr. in Vintage White, is a great little guitar and is a new model. Blending influences from three sources – the classic Gretsch White Falcon, the Jet body design, and the new Gretsch Players models. Aside from being very flashy, this is a great playing and sounding guitar. Every once in a while, something built as a promotional item for an industry trade show really takes off, gets more intention than expected and is put into production. This was the case with the 1954 Gretsch White Falcon, intended to show off the elegance and quality of the Gretsch electric archtop line at the 1954 NAMM trade show in California. The Gretsch G6120RHH is the signature Reverend Horton Heat model, based on 1955 and 1958 6120 specifications. It features classic lines and Western decoration, plus a number of modern upgrades like locking tuners and pinned adjustable bridge. 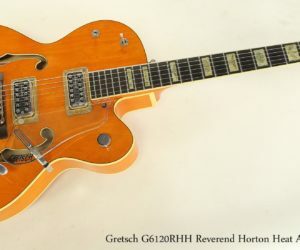 Here’s one we don’t see very often – a Gretsch G6120RHH Reverend Horton Heat Archtop signature model! This is based on a combination of 1955 6120 construction and 1958 style electronics. 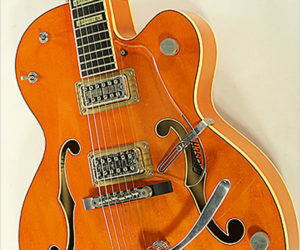 It has all the 1950’s Gretsch western decoration – the G-brand on the body, the Steer-head and cactus inlay set, 50’s style Bigsby arm and of course the Gretsch orange finish. It also has a couple of very modern upgrades – a pinned bridge and locking tuners for much faster string changes. This guitar is in all original condition and dates to November of 2005, the first year the Reverend Horton Heat signature model was available. It’s in very good condition and plays great. Myself and some of my mates have developed a charitable organization in Toronto called Guitars for Kids Toronto. We provide new and previously loved guitars to underprivileged kids in Toronto through Big Brothers and Sisters. I was looking for a “drop-off” depot in the east-end, where guitar donations could be left for pick-up. If you have been to 12th Fret, you would know that they do not have much room for stocking additional gear – especially not for sale gear! Because 12th Fret saw the value in community support…they graciously signed up to become a drop-off centre and have helped to promote GfK Toronto through their newsletters, web pages and social outlets! Special thanks to Vicki, Grant, Brian and the team for your continued support! Great job installing the pickup in my old Martin. I’d like to thank Jay in Repairs for doing such a great job installing the pickup in my old Martin. It seems to play much better too with the different bridge. It is hard to explain to the uninitiated how nuance plays such a huge part in our musical adventures. And it is strange that after 45 my D35 still sounds like me! It is here now and is beautiful and plays like a dream! Mike, I just wanted to let you know that the Thunderbird arrived safely just now. It got stuck in customs in Chicago for a couple of days (the post office told me that it always happens that way with everything that comes from abroad) but eventually got on its way again. Anyway, it is here now and is beautiful and plays like a dream. It sounds great through my amp, and not surprisingly, sounds just like my 1976 Thunderbird. I was delighted at how light it is too.